I know what you're thinking. Most of you are probably wondering what this young Asian boy is doing fiddling with these Middle Eastern/Mediterranean treats. Trust me, I was so clueless throughout the entire process that I was wondering the same thing too. See, I've only had it once before something possessed me to give these a crack at home. You don't see stuffed vine leaves anywhere in Malaysia. My colleague had brought some that her Mum made to share in the office. It tasted so interesting and I really enjoyed them. It's been a while since I've experimented in the kitchen so I asked if she could help get me some vine leaves so I can make them at home too. I was definitely nervous about making them because cuisines from that region are really, really unfamiliar territory to me. But I'm glad I tried them out because they were much simpler than I thought and turned out quite tasty. They were actually quite quick and easy to roll. It was only that there was a lot of them to do, so make sure you trick someone in your family to helping you at it too. Decided to add pine nuts as well to give the filling a bit of crunch, which ended up working really well. Love the colours from the filling! 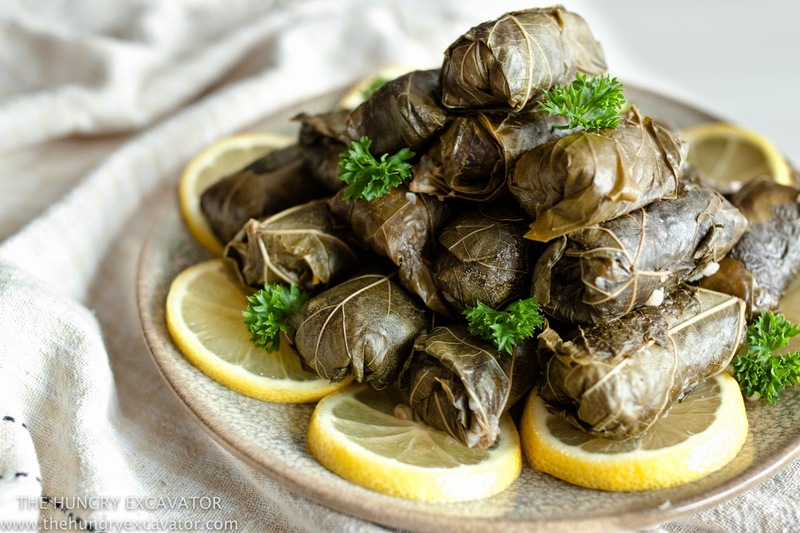 Dolmades reminds me a lot of dumplings. They're prevalent in many Mediterranean and Middle Eastern cultures; just as dumplings are to people with an Oriental heritage. The exact origins of both dishes are highly debatable but who the hell cares, they're tasty and that's all that matters to it. 1. Bring a large pot of water to the boil. Place the vine leaves in a pot and boil for 5 minutes. Remove vine leaves and place in a large bowl of cold water to cool. 2. Heat up a small frying pan. Fry the onions in the olive oil until it becomes fragrant and translucent. 3. 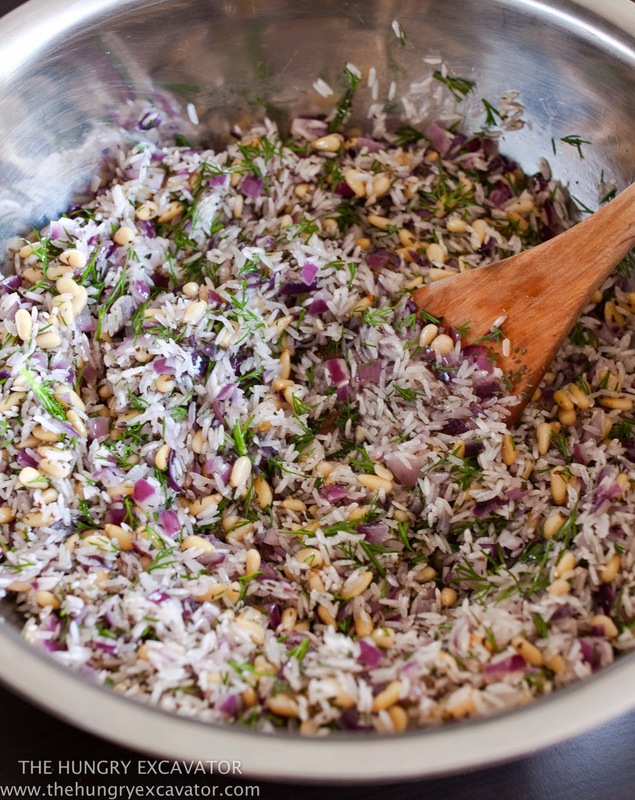 Remove onions from pan and place in a large bowl. Mix in all the remaining ingredients except the stock and lemon. 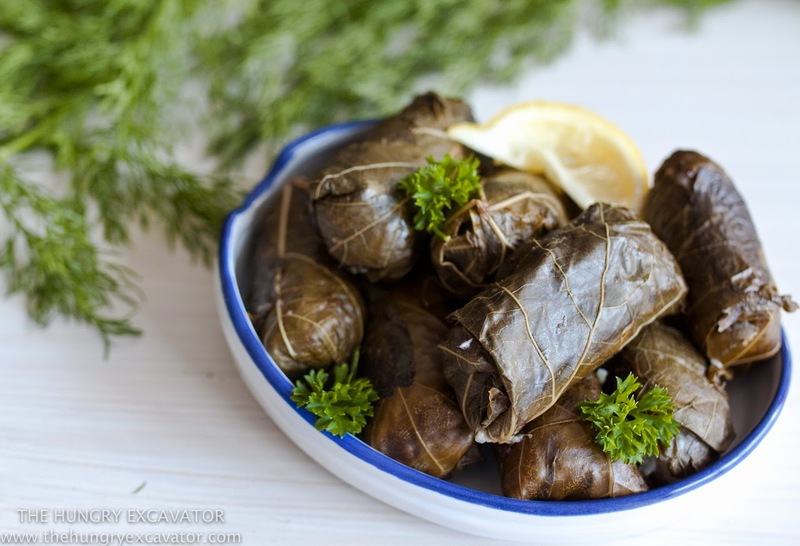 Tip: You may layer 2 or 3 vine leaves on top of one another to form a larger sheet if you find that some leaves to be too small or have holes. 5. 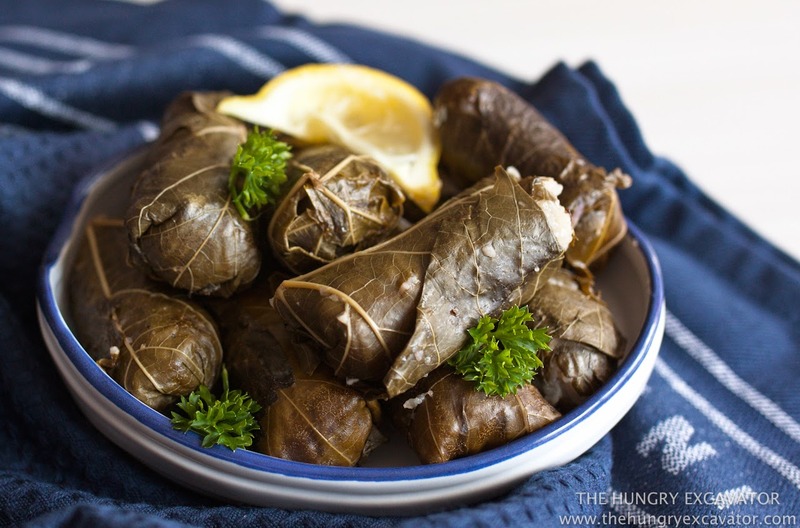 Place all the vine leaves, seams down, tightly together at the bottom of a pot. Place a heavy plate at the top of the stack to hold it down tightly. Add extra weights, if possible. 6. Place the stock in the pot until all dolmades is submerged in liquid. Simmer for 50 minutes. Top up with more stock or water if necessary. Remove from pot and squeeze generously with lemons just before serving.